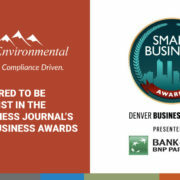 Denver, CO – AET Environmental is proud to be a finalist in the 2019 Small Business Awards in Denver Business Journal’s 2019 Small Business Awards. 99.5% of Colorado businesses are small businesses, according to the U.S. Small Business Association, and they employ more than a million people. That’s why the Denver Business Journal highlights those companies and celebrates their success. 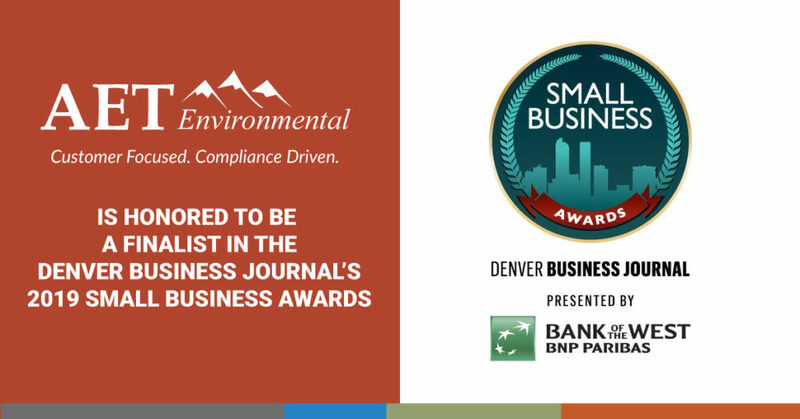 These awards recognize excellence among entrepreneurs and small businesses in metro Denver. Honorees will be selected based on a number of factors, including financial performance, historical achievements, contributions to industry, contributions to the local economy and potential to shape metro Denver’s business community. employees & announce the winners in 5 categories based on size. Heavy appetizers & wine/beer included.